IPv6 was created to increase the number of available devices directly connected to the internet from 4 billion to too many to count by increasing the address space from 32bits to 128bits. In some ways, IPv6 was made for countries that will need to bring millions of users to the internet in the coming years. Today, finding IPv4 space is difficult and expensive (on the secondary market, an IPv4 address is sold for around $15 to $18, and that number is increasing). As a result, it can be an issue for new entrants. While Carrier Grade Network Access Translation (CGNAT) is a solution option, it creates complexity and can lead to troubleshooting, security, and privacy concerns. This is because with CGNAT, you need to keep a log-matching connection between the internal and external networks at each NAT gateway. This is so that you can trace any connection back to the internal device; as a result, you have NAT of NATs, and the logs must be stored securely for privacy purposes. With direct end-to-end connections, however, you only need to record which device had which IP. This is what makes IPv6 such an attractive option. IPv6-only networks are now possible on mobile networks using 6 to 4 conversion gateways, such as NAT64/DNS64 or XLAT. The connection is end-to-end over IPv6 and passes by a NAT when the device tries to reach an IPv4 service. Because many connections are over IPv6 nowadays, the NAT part or conversion from 6 to 4 is not as heavy as if you had to convert everything from 4 to 4, like NAT and CGNAT do. The other factor is to have applications that work in this environment; for instance, XLAT on Android makes it easy, because for the application, it sees a virtual IPv4 address on the device itself. For iPhones, Apple has mandated NAT64/DNS64 compliance for all applications since June 2016. T-Mobile USA has been one of the first companies to deploy an IPv6-only network at scale, and has enabled many other mobile providers to do the same. See here for more details. 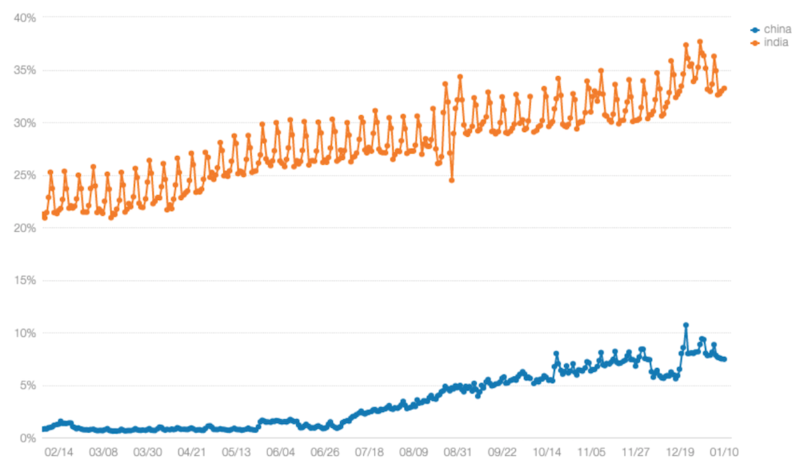 Over the last year in India, we’ve seen constant growth of IPv6 usage. For example, Reliance Jio has moved nearly all their Android devices to an IPv6-only network. This is a huge deployment of devices to IPv6 (Jio had 130 million customers in October 2017). It started around September 2016, and the market share of Reliance has been increasing since. For China, the story is a bit different. China for years had an IPv6 deployment on their Academic and Research Network. The government announced in September 2016 that its plan was to reach 200 million users on IPv6 by the end of 2018 and 500 million by the end of 2020. According to 2018 stats, it is estimated that there are about 800 million internet users in China, so 200 million would be about 25% IPv6. In July, at a Chinese industry conference, the various providers publicly committed to the plan: Telecom providers decided to start to deploy IPv6 on mobile LTE networks, while service providers like Baidu, Tencent, and Alibaba committed to having their services reachable over IP6. Since July 2018, LinkedIn has seen serious growth of IPv6 in China, from about 1-2% to more than 5%. While our data is likely not comprehensive enough to extrapolate from these numbers how close China is to its target of 200M internet users, it's clear that there is fast growth of IPv6 there. By the end of 2018, they reached 8% to 9%, from our point of view. Several organizations measure IPv6 deployment, including APNIC, Google, Facebook, Akamai, and the Internet Society. We don’t necessarily see the exact same numbers, however, because we don’t have all the same users, nor do we use the same methodologies. But what all of the available data shows for IPv6 growth in the APAC region is that India and China are likely to very soon have a bigger deployment of IPv6 in terms of devices/users than in the USA, which is past the 50% IPv6 deployment rate for a total of about 300 million internet users. We tend to track by the percentage of deployment of IPv6 vs IPv4, but we also need to be mindful of how many internet users these deployments represent. Deploying at this scale is not an easy task. IPv6 deployment is all happening behind the scenes, but it is happening in several countries that are gaining market advantage, increasing opportunities, and removing tech debt as a result (more information available here). At LinkedIn, we are following this path by working to enable IPv6 everywhere. Thanks to everyone at LinkedIn who’s worked on putting the site on IPv6, our network team, and the traffic and site speed team for tracking IPv6 performance.